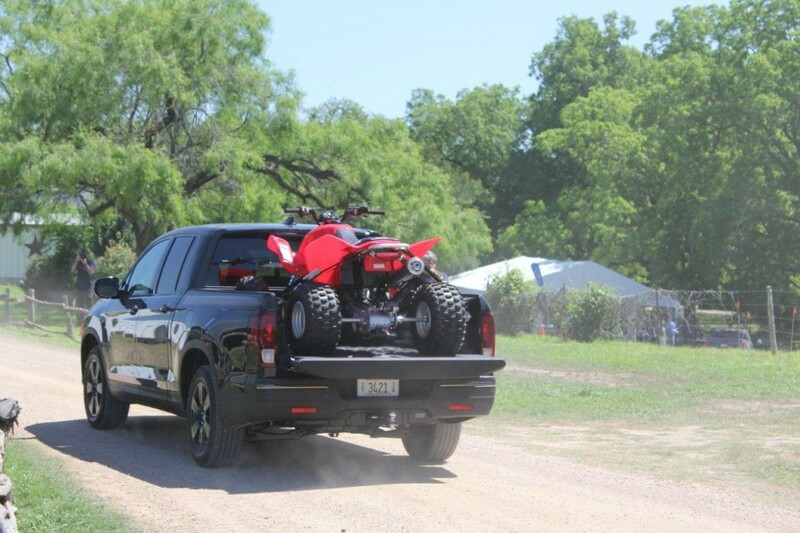 The 2017 Honda Ridgeline is the second generation of a truck that debuted ten years ago to mixed reviews. The original Ridgeline was quirky, in its look and some of its design features. It polarized its market into lovers and haters – however it has to be called a success when you consider that Honda sold everyone they built and didn’t feel the need to update the original – till now. Down here in Texas we stood around a truck that has maintained its “Hondaness” while changing up some of the more peculiar design features that set the original apart. Gone is the behind the cab stabilizing triangle, and the cab and box are now divided unlike the first slab-sided one. The wheelbase is also three-inches longer allowing for a deeper cargo box (an added 5-inches) and suspension is upgraded, front and back. Interestingly, despite the truck growing its curb weight is actually lower than that of the original – thanks to more aluminum and high-strength steel. Retained are the in bed trunk and twin action tailgate the folds and swings. These items were wildly popular with the original and now, if anything, are even further emphasised in the product literature. They were unique in 2007 and continue to be today. But what is really key to the Ridgelines appeal is the fact that it is the only pickup on the market that truly rides like a car. I thought about this ride characteristic as I toured the hill country of central Texas – the ride is so much more supple than other trucks, it holds the corners lightly but with a dead-flat attitude and its height and sightlines erase the fact that there is a cargo bed bringing up the rear from the driving experience. The Ridgeline rides on a MacPherson strut front suspension and a multi-link independent rear. It has front and rear stabilizer bars and the steering is electric with a tight 3.04 turns, lock to lock. Supporting the weight are 18-inch aluminum alloy wheels with all-season tires. However, a key piece in the ride puzzle is something called torque vectoring – and this is part of an all-new AWD system that will be featured on every Ridgeline sold in Canada. So, while Honda can’t claim to be the first to use an AWD system that moves torque to each individual wheel – again – this is something more likely to be found on a car, but for this truck it not only makes for a better ride but also improves the Ridgelines off-road abilities. This is where some buyers will decide that the Ridgeline is just not enough truck for them. From what I saw, that’s OK. Honda is not trying to build an F-series killer – instead they are filling a market niche that while small is significant. My thinking on this led to picturing the hammer drawer in my toolbox. I own at least a dozen. Framing hammers, claw, ballpean, metal working, deadblow, rubber, sledge – etc. All hammers –each with a specific job – isn’t that what the Ridgeline is? So looked at that way it takes the wind out of the “is it a real truck” argument. It is and it does the job it was designed to do. For instance the Intelligent Variable Torque Management I mentioned. Called the iVTM-4, this torque-vectoring all-wheel drive moves power between the front and rear axles (that’s nothing new) however another set of clutches distributes engine torque between the left and right rear wheels as well. The capacity to overdrive the outside rear wheel by 2.7% creates a yaw moment that improves cornering. While the iVTM-4 is always “on” the Ridgeline does give the driver some control with a button-operated Intelligent Traction Management System that offers different operating modes, Normal, Snow, Mud and Sand. These are self-explanatory and with changes made to the shift patterns and power applications by the computer offer noticeable torque variations as you drive. Driving this new platform is a more powerful and efficient direct-injected 3.5L i-VTEC V6 engine and a 6-speed automatic transmission with wider ratio spread. The engine makes 280 hp and 262 lb.ft of torque. So while this is the same displacement as the original Ridgeline carried it’s not the same design. This 3.5L makes more hp, but more importantly 20 percent more torque – most of which comes on lower in the powerband. Add to this the rejigged gear ratios in the transmission and this truck’s off-the- line performance is much improved. Where this improvement really showed was in the off-road portion of the driving event outside of San Antonio. This was not the Rubicon or some deep desert trail, but it was a cross-section of water, mud and sand that replicated conditions that only a small percentage of Ridgeline owners will ever find themselves in. The added low-end torque was evident when the truck had to get itself out of the soft stuff and up the steep hills. It’s only downside is the clearance, which is adequate, but for me seemed low. Also on display were the improvements to the Ridgelines safety systems – active and passive. For instance Honda Sensing has driver assistive features that include Collision Mitigation Braking System, Lane Departure Warning, Forward Collision Warning, Lane Keeping Assist System, Road Departure Mitigation and Adaptive Cruise Control. Depending on trim it can also be equipped with Honda LaneWatch, Rear Cross Traffic Monitor and a blind spot information system. All Ridgeline’s come equipped with a Multi-Angle Rearview Camera. Standard safety features include ABS with Brake Assist and Hill Start Assist; Vehicle Stability Assist with Traction Control; Trailer Stability Assist; Agile Handling Assist; dual-stage, multiple-threshold front airbags, driver and front passenger side airbags and side-curtain airbags for all outboard seating positions; and a new Tire Pressure Monitoring System with real-time display. So while the first Ridgeline was pushed as a half-ton pickup – this time around Honda seems content with its truck being labelled a mid-size. As such its capacities of 1,584 lb payload capacity and a 5,000 lb tow limit are firmly in line with its competitors. Still, this truck started as a car (or van) based pickup and its manners continue to remind anyone who climbs in that it’s not a traditional ladder-frame truck. However the telling evidence of who is drawn to this truck comes from Honda itself. 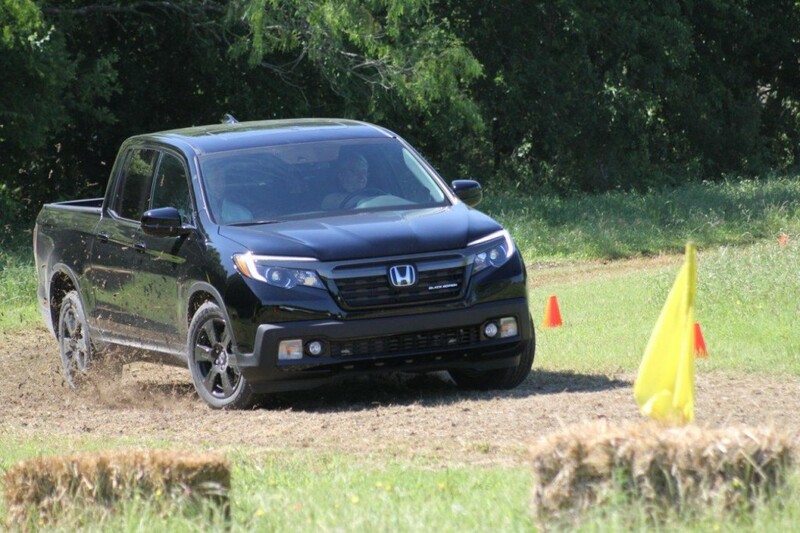 Nearly 30% of Ridgeline buyers (according to Honda internal buying data collection) come to the truck from SUVs. 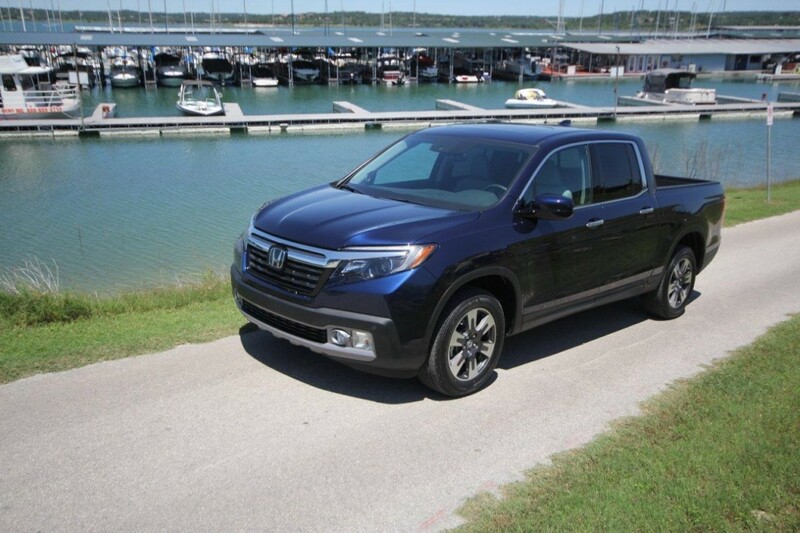 So, while Ridgeline is not a strong conquesting vehicle in its market – it is very strong with buyers who finally come to the realization that rather than a closed in SUV they need a truck. For what Honda is trying to accomplish this is going to work. 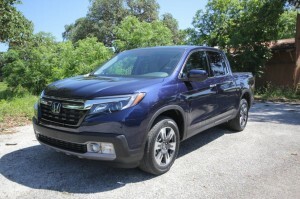 So while the Ridgeline is different in so many ways, Honda is following the current hot trend of adding upmarket trim packages to trucks with two more of its own. The Ridgeline’s original three models have now expanded to five; and in each you’ll find “available only in Canada features” like 225- watt AM/FM/CD audio system, front wiper de-icer, mirror integrated LED turn signals, heated rear seats, rear climate controls, ventilated front seat, power folding mirrors and rain-sensing wipers.